Bangladeshi jute is well known as ‘Golden fiber’ because of the quality of jute it produces. For centuries, Bangladeshi Jute dominates the world market through its higher quality fibers. Jute was the single most important export item of Bangladesh till the end of 1980s. Still jute is one of the largest export-oriented industries in Bangladesh and its contribution to the national economy is significant. According to the Bangladesh Jute Mills Corporation, major export destinations of Bangladeshi jute & jute goods are Middle East, African Nations, European Countries, South East Asia, Australia and the USA. Jute and jute goods export maintained a steady growth as the country earned $66.18 crore in the first seven months (July-January) of the current fiscal year (FY2017-18), which is 17.36% up from the previous fiscal (FY2016-17). The country earned $563.9 million by exporting jute and jute goods during the same period in FY2016-17. 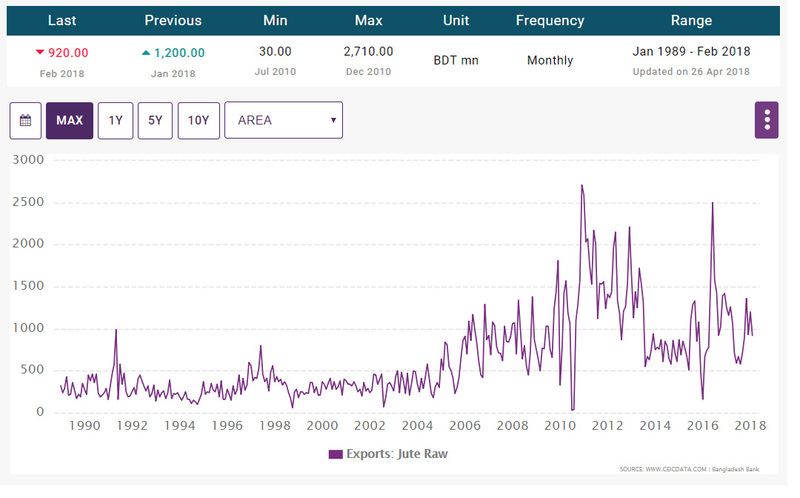 According to the Export Promotion Bureau (EPB), earnings from raw jute export were $95.5 million during July-January period of FY2017-18, from jute yarn and kundali were $414.6 million, from jute sac and bag were $92.5 million and from other jute products were $70.3 million.